Designed to help you lose, maintain, or gain weight, this calorie counting and exercise tracking app is simple, free, and effective. Once you’ve worked out your daily calorie and nutrition goal, track each meal, snack and fitness activity (it syncs with step counters too), and you’ll have a daily motivator in the palm of your hand. The app holds data on over two million foods so you can type in the brand and it will work out the nutrients. You can also simply scan the bar code, or manually enter the calories yourself. An added bonus is that MyFitnessPal can be used in a similar way to Facebook, enabling you to add friends, post updates and take part in forum discussions – all designed to keep you motivated. As well as being available for both Apple and android devices, it can also be used on a desktop computer, so you can keep track of your nutrition and exercise goals at work, home or on the move. With regular reminders if you haven’t used it for a while, the app keeps you accountable for what you put in your mouth – but you do need to keep committed to your logging and I admit that, at times, it can feel like a bit of a chore. 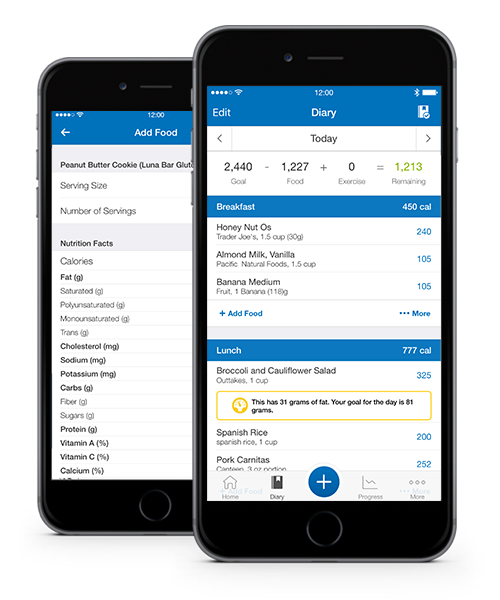 MyFitnessPal has been around for a while, and although there have been imitations, in my opinion it remains the most simple and effective app if you want help to reach your health goals.